How many programs can be recorded with a Genie DVR? The Genie DVR can record 5 programs at the same time. Can I watch live TV while 5 programs are recording? Like any other DVR if it is using all its tuners to record, you can watch something you’ve recorded, but you can’t watch live TV. How many Genie Clients can I have? You can have up to 8 Genie Clients but only 3 can be used at the same time. If you try to use a 4th, you will get a message on screen. Can I watch Live TV on a Genie Client while recording 5 things? You can watch one of the programs being recorded. If you try to tune to another channel you will get a message asking you to cancel a recording. Can I watch something recorded while 5 things are recording? Yes, you can do that on the Genie HD DVR and also on the Genie Client. How many Genie HD DVRs can I have? Right now DIRECTV only allows one Genie HD DVR on your account. Can I have other DVRs in my house? Yes. You can have as many as you want, but you can only share programming between 8 devices. Can I share programming between my Genie DVR and my HR24 DVR? The Genie DVR and HR24 DVR can see each other and share programs. The Genie client can also watch programs recorded on an older HD DVR. Do I need a Genie DVR if I have a Genie Client? Yes, the Genie Client will not work without a Genie DVR. Can I pause live TV on a Genie Client? 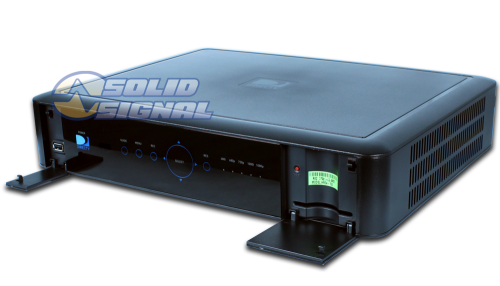 Can I watch programs from a Genie DVR on an H25 or other HD receiver? Does the Genie system require the $3.00 per month whole home charge? Do I need a Genie Client for every TV or can I use one client for multiple TVs? It’s just like a DIRECTV receiver. Each TV needs its own client. What is the DIRECTV RC73 Genie Remote?